The city’s latest proposal to improve safety and transit service on Potrero Avenue is slightly different than earlier versions of the plan. 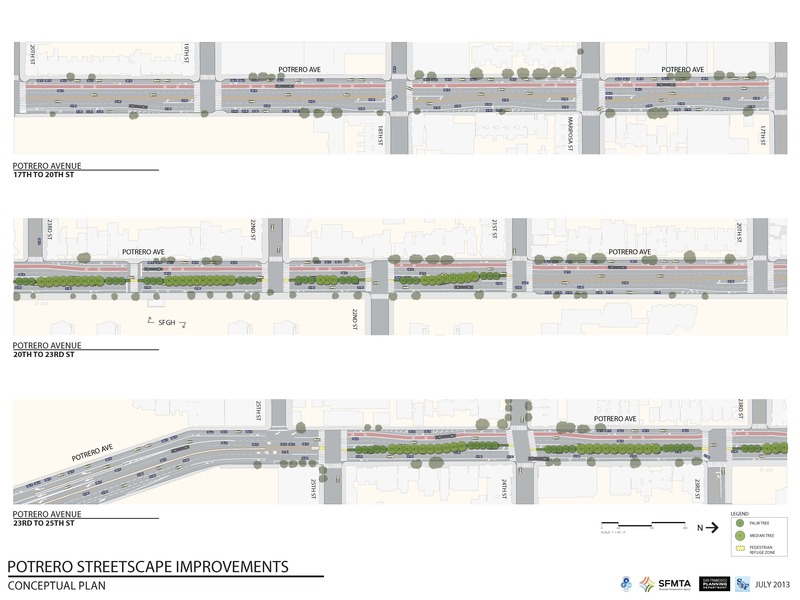 While the redesign would expand pedestrian space, some residents at a public meeting yesterday pointed out that it could do much more to make the street safer for biking and walking. Staff from the Department of Public Works, the SF Municipal Transportation Agency, and the Planning Department presented the plan at a community meeting yesterday at SF General Hospital, which sits along the stretch of Potrero between 21st and 25th Streets where street improvements are planned to complement an ongoing rebuild of the campus. Planners announced that the project’s scope has been expanded to 17th Street, but the basics haven’t changed much since the last public meeting about this project in March. Under the new proposal, Potrero’s narrow 9-foot sidewalks would be widened to 14 feet on the east side of four blocks (not quite as much of an addition as the original proposal for 15-foot sidewalks). The plan also calls for corner bulb-outs and a planted median, six to seven feet wide, with pedestrian refuges and some left-turn lanes, and the northern crosswalk would be re-opened at the intersection with eastern 23rd Street. With Potrero’s narrow sidewalks obstructed by poles for overhead Muni wires which can’t be moved, “there’s really no place to get through with a wheelchair, a walker — you need a clear path of travel to do that,” he said. Potrero’s sidewalk widths, he noted, will still be “under-optimal on one side, and on the other side we’re under even the minimum” for current street standards. “We’re all in a position where we would love to have all these things happen on Potrero, but the reality is we only have so much space,” said Ben-Pazi. Potrero between 21st and 25th Streets. See ##http://sf.streetsblog.org/wp-content/uploads/sites/3/2013/07/sections.jpg##the other cross-sections here. Planners are sticking with the removal of the northbound transit lane, which they say is too narrow for buses. However, they’re now proposing a new colored bus lane on the southbound side of the street, from 17th to 25th. Some Muni stops, which are generally a block apart, would also be removed to speed up service, expanding the spacing between stops two to three blocks. Altogether, the improvements are expected to boost Muni speeds by over 20 percent on this stretch of Potrero, said SFMTA planner Chris Pangilinan. All four of Potrero’s existing traffic lanes would remain in the plan, as would over 90 percent of the roughly 1,150 car parking spaces within a block of the street, said Pangilinan. Pangilinan claimed removing a traffic lane to make room for sidewalks, bike lanes and transit lanes would result in unacceptable car congestion. But some attendees, like Josh Handel, didn’t buy it. “This does not need to be an alternative to 101, this does not need to be a high-speed route,” he added. Potrero’s bike lanes would see little change in the plan — they would still be marked only with paint, and mostly retain their 5-foot widths (5.5 feet in some places), though the northbound lane would run curbside between 21st and 25th, where parked cars would be removed. Under an option proposed at the first meeting, the bike lanes would have gained a 2-foot buffer zone and up to an extra foot of width. Although planners insisted that a center median was needed to create pedestrian refuges and left-turn pockets, Elliot Schwartz, a neighbor who bikes with his son in a rear seat, said some of that space should be re-allocated to create protected bike lanes that are comfortable for families. He also said center medians seem to create a “tunnel effect” that encourages drivers to speed. Removing the bike lanes on Potrero and placing them on Hampshire Street instead was among the options planners considered but didn’t adopt. Merchants on 24th Street are also unhappy about the roughly 100 parking spaces that would be removed for wider sidewalks because they believe many of their customers drive, said Eric Arguello, a co-founder of the merchant group Calle 24. The project is expected to be funded with $3.2 million in Prop B Street Improvement bonds, as well as funds for the Muni Transit Effectiveness Project that could go to the ballot in November 2014. It is expected to be constructed from April 2014 to August 2015. THe problem isn’t with construction trucks. The problem is with people’s personal cars. Nobody is saying all cars need to go away. Cars have a use, and carrying heavy construction materials is one. Driving to work solo is not one though. And it’s the latter that is causing the problem. If the latter went away and it was only people driving cars who really needed to, our problems would be solved. in what sense is the Panhandle not a median? Fine. It’s a median. You win! Once again you aren’t asking real questions and are approaching this issue from a false premise. Is biking on a dangerous street safer than biking on a safe street? No. Does making a dangerous street safer make it safer? Yes. Does it make it safer than alternatives? We’d have to do a study which I’m not prepared to. I would suggest you get on a bike and do some fieldwork. The current bike lane on Potrero is not safe for most users. A protected, or even buffered bike lane would be much safer than the street currently is. Would it be safer than Hampshire? I’m not sure, Murph has pointed out connection issues making that route a bit of a dead/dangerous end. There isn’t just on type of bike lane or bike infrastructure. For ex: the green paint and buffered bike lane w/ posts on Fell is safer than the previous non-buffered bike lane on Fell. Is cycling along a bike lane on a fast busy road like Potrero safer than cycling in a quiet leafy street like Hampshire? Or not? There are no leaves on Hampshire. thank you neil for bringing the tough questions like “in what sense is the panhandle not a median?” I can’t wait to teach my nephew how to bike on the city’s beautiful street medians. Both of you: stop appropriating the need for emergency vehicles for your car-centric cause. If you want emergency vehicles to be able to get through the area quickly, you get rid of the damn cars in the road, not take away from bicyclists, pedestrians, and public transit. The inefficient cars being driving by one person are what prevent emergency vehicles from moving through the area. And I know what you’re thinking now: “But by adding the bike lane, you made traffic worse.” But your not thinking it through properly: the root cause is there are so many cars that making the road safe for vulnerable road users can’t even be done without the damn cars clogging up. The real problem is too many people driving. And further, taking away parking does nothing to traffic (and hence to impeding emergency vehicles), so there is no excuse there. I do have to say: you fit the exact bill of a troll we banned a couple of years ago. Are you back? Yes, I do not like Dolores St. It’s a total waste of space (exacerbated by the fact that it has this ginormous curb which further discourages anybody from using it). I live 1 block away from it and every time I pass by it or go down Dolores I think about what a waste of space it is. However, I’m willing to tolerate the use of the median there since it already exists, but there is no reason whatsoever to be *adding* medians anywhere. As for the Panhandle, it’s not a median. And even if you want to call it that, the point is moot because pedestrians and cyclists actually *can* enjoy and take advantage of the greenery there as well as travel there safely separated from the cars. So it doesn’t benefit just cars and that’s what makes it great. So I don’t care if you want to argue technicalities of whether the Panhandle is a median or not, for if the city wants to build medians like that (200 ft wide with tons of safe space for pedestrians), then those are the kinds of medians I’m happy to support. So if it makes you feel better, then I’ll change my statement to say: I’m against medians unless you make them 200 ft wide with lots of greenery and safe space for pedestrians and bicyclists. SF General is also an expanding employment center as well. So if you think that traffic will just go away if you take away lanes I don’t think it will work. There are plenty of streets where you can spread the load, but some people prefer the “prove the point” by encouraging modal confrontation. Hamshire could be designed to be a bike boulevard, where it is still mix traffic with automobiles but it would be prioritized for bike movement and discourage through auto traffic. The bike lanes on Potrero can stay for those who want the access the hospital. 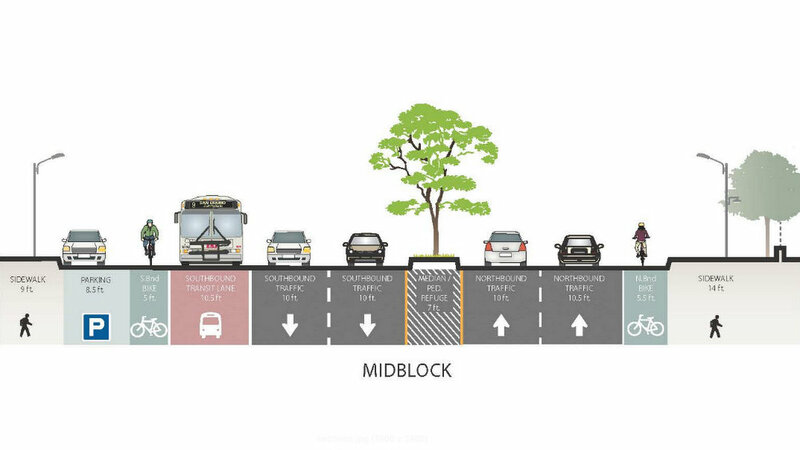 You need to balance the needs and I think there’s a good option to those who don’t like biking along side with higher traffic. They can just drive down Hampshire. What do you have against the mostly minority population that lives on Hampshire? You’re missing my point. The fact that there are so many cars on Potrero is the problem, I agree. So how do you fix that? You get people to stop driving? And how do you do that? You get them using other methods of transit? But how can you do that if the other methods of transit are non-existant, terrible, and/or dangerous? Answer: you can’t. So you need to start creating the infrastructure to provide other options. When you take a lane from cars and avoiding correspondingly better public transit, walking, and cycling opportunities, there is a no loss in the capacity of the road to move people. In fact, there is an increase in capacity since *all* other methods of transit are more efficient than cars. So nobody is saying its trivial, but the point is that people use what you build. If you keep making roads that prioritize cars at the expense of all else, then you get people driving. If you want to change that, then you need to make roads prioritize the other modes of transit. Yes, there will be a rough transition period where people will have to adjust to the new realities. For example, traffic on Potrero would temporarily get worse when you removed a lane. But many people would get sick of dealing and find other ways to get where they are going. That’s the point. No it is all about the bike folks getting their statement across. Andy, stop. Come on now. We are not talking about adding auto capacity, but maintaining them despite the fact that there will be more travel demand. Yes. Many of those trips need to be diverted but the fact that it is a hospital we shouldn’t be making it so congested that it would be hard for emergency vehicles to access it. Downtown SF is already pretty congested despite a variety of transit including the high quality ones like BART. Potrero doesn’t have BART so you can’t expect the magic hands would make traffic go away by taking away lanes. TIL: Emergency vehicles have sirens. http://cyclingincities.spph.ubc.ca/injuries/the-bice-study/ shows that “cycle tracks” and “residential streets with a bike route & traffic diverters” are comparable in safety and preference. I’m talking about *reducing* auto capacity though so we can increase capacity for other methods of transit. Or, I’m okay with leaving auto capacity as-is but removing parking. Either way, we need to accommodate other modes of traffic better on Potrero. And I’ll say it again, if car traffic is so bad that emergency vehicles are being affected, blame the motorists not the poor pedestrians, cyclists and public transit users. I love how you are asking the ones who have so little in the first place — pedestrians, cyclists, and public transit users — to give up there scraps of the urban design while the motorists who are given total priority are expected to give up nothing so emergency vehicles can get through. If you really care about emergency vehicles getting through, then let’s post signs on the roads that say to car drivers: “Please do not drive on this road as you risk blocking emergency vehicles path to the hospital”. It’s just amazing that you see cars blocking emergency vehicles as being the fault of bicycles and pedestrians just because they want the ability to travel down the road safely while cars are just giving up convenience. And as @murphstahoe:disqus pointed out, emergency vehicles have sirens so it shouldn’t be a huge issue anyway. I’m with you in my preference for the quieter side streets. However, there are many people who prefer the more direct routes on busier streets. The infrastructure needs to be able to support bicyclist with varying needs and preferences. Personally, I do not ride on Fell/Oak after trying it a couple times. From the wiggle to panhandle, I walk my bike. I didn’t like merging with the big line of cars at the gas station. On the way back, I take page down the hill. However, many bicyclist do use the Fell/Oak bike lanes. If I think road medians are a safety feature, as SFMTA does, that makes me a troll? 1) Dog owners. Watch your step on that grass. 2) Drivers. Drivers looooove to zoom from stop sign to stop sign trying to outwit the timed lights on Guerrero while heading to the 101 Duboce onramp northbound or 280 San Jose Ave onramp southbound. Wha…whaaa? Crosswalk at Dolores Park? You mean I have to stop for those pedestrians despite there being no stop sign? Oh gosh, I didn’t see those pesky pedestrians…. Through traffic in autos is already discouraged on Hampshire. As murpstahoe has pointed out – that street does not go through anywhere. Bike lanes or bollards to prevent cars are not necessary on Hampshire as it is already low volume and low speed. At least one resident is asking for protected bike lanes on Portreo, but my guess is that more would use them if available. I needed to go from south park over to the mission and ended up walking my bike on Portero for four blocks until I reached 17th street. Hampshire was not an option to get to the mission district. i do not like busy streets but would use a protected lane was available and the only option. My impression is that Portrero is a mile long freeway on ramp and off ramp that goes right past a hospital. What is wrong with that picture? The standards are all messed up. 5 feet for a bike lane is inadequate, most especially when placed next to a door zone parking lane. Bike lanes are minimum 8 feet in Holland and it is safe for 4 year olds. The planners do not seem to be listening to the residents who are questioning why 15 feet sidewalks and 7 feet mediums are needed. Not really understanding how the muni wire poles are obstructing wheel chairs and walkers.